Okay GreaseBookers, I know that most of us love our dogs. Since I have been in the oilfield, I have met only one person who did not like a dog in a pumping truck. It happens to be the man I pump for now – although unless there is a large rain (not likely where I live) I usually use my own pickup. There’s a story that goes with this…and you will hear it later in this blog. The point is while there are many liabilities to being a pumper, including people thinking we just drive around taking meter readings and that we are fundamentally dumb, there is at least one benefit to the job aside from a decent paycheck. Many times the company allows us to take our dog with us pumping. For me, this particular benefit fell into the top three benefits of the job as a full-time company pumper. I mean, let’s face it; where else can you go to work where you can take your best four-legged friend with you? Also, where else can you avoid having to work with people most of the day? But that’s another column isn’t it? All that said, I learned in the first year of my life as a pumper working in Perryton for Chaparral Energy, this freedom to take my dog also held its liabilities. And I am not alone in that discovery. Most of my pumper friends who toted a dog along also discovered these problems. My best friend, Evelyn discovered the hard way several times what it means to carry a pet along on the work day. And just a note here, in her 38 years in the oilfield she has been known to carry everything from a pet raccoon to a pet bobcat, two German Shepherds at separate times, a Pitbull cross, two Blue Heelers at separate times and now a ginormous Mastiff named Giget and a whiney, neurotic Blue Heeler named Norman who has an anxiety disorder. I, on the other hand, had one pumping dog. Her name was Nipper. She was a Cairn Terrier and I soon began referring to her as a “terrierist” because she literally terrorized me at times. Nipper liked to find long dead animals and eat them and then puke it all up into the console of my pickup. She also found a pile of fresh, human poo after a work-over rig had been on one of my wells and rolled in it. People who don’t know what a Wheaten Cairn Terrier looks like, they have very long, blond hair. So the day I allowed Nipper to ride with me in my current boss’s brand, spanking new pickup (about three years ago) I didn’t realize what kind of a day it was going to be. The whole reason I took his truck was that he was out of town on a vacation and the lease roads were muddy. My truck, Ol’ Greenie, doesn’t have four wheel drive, see. So sensing a good day, Nipper bailed into my Boss’ 2014 (with velour seats…I know…go figure). Anyhoo, everything was fine but that particular route is really uppy-downy. Lots of hills. And so Nipper got sick and puked in the console and on the seats before I could say Jack Sprat. Before he came home I cleaned and cleaned. I felt that his pickup was better than when he bought it when I left it in his drive, ready for him to start his next working day. “No! Of course I didn’t,” said I. “Where’d this hair come from,” he asked. “Well, the truth is, one of my best friends wanted to go and watch me pump and she has long, blond hair. I sure hope you don’t mind,” said I. “Well, as long as they don’t get out at the well site,” he said. “I knew it.” He just laughed and told me not to do it again. Since then he’s purchased another new pickup. Oddly, I haven’t ever been in his pickups since. Even in the mud, he lets me take Greenie. Hmmmm. I wonder why? GreaseBookers, this has been a tough year for everyone. In Northwestern Oklahoma, pumpers, farmers, residents – we have all struggled to push through not one but two disasters. First we had an epic ice storm that kept many well sites inoperable for more than one month and then we have had one of the single most devastating fires in history in my area. We have lost more than 1 million acres up here and easily over 1,000 cattle. There has also been damage to oilfield assets and again, the power has been affected. Ranchers have, in some cases, lost their entire businesses. It will be a tense and heartbreaking year ahead for these people. So I felt I would write a little something that just took our minds off of the awfulness for a moment. And to that end, I decided writing about our love of living things seemed appropriate, given the tragedy we have suffered of late. Those of us who haul our dogs with us pumping, know what a comfort they can be when the days get long. But I digress. When I met my best friend Evelyn, she told me of some of her pet hauling disasters and yet for some reason I failed to take her seriously when I got into the business. I had to learn on my own I guess. 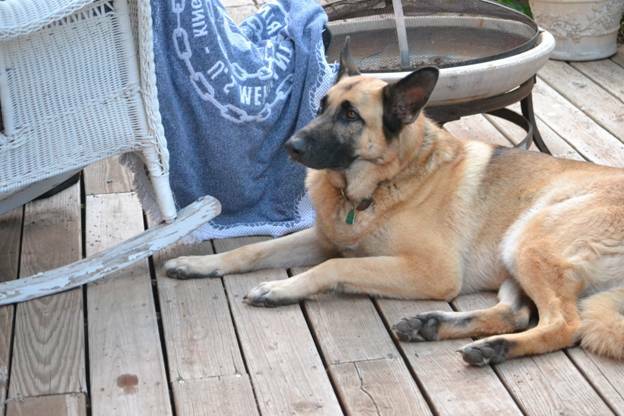 Principal among her animals was Elvis, her most beloved dog – a beautiful German Shepherd. In a flash one day Elvis chased a rabbit under the weights of a pumping unit and was badly injured when the weights came down and crushed his hip. He lived through that accident though, with a combination of effort from me and Evelyn, each hauling him back and forth to the vet for treatment. For several years after that Elvis trotted behind Evelyn everywhere she went on the location. I took him with me a time or two and I can still hear the gentle thud, thud, thud of his feet falling in the dry Oklahoma dust behind me. And there was the cadence of his panting, huh, huh, huh, huh, right beside me as well, as I worked on my own locations. For some reason, I never felt alone with him around. The other benefit of having Elvis around was that he was my dog Nipper’s only true friend. Nipper had some sort of mental disorder and she hated everyone but Elvis. In fact, Nipper was so in love with Elvis that when she would bolt from me and be running, totally out of control down the lease road after a coyote or rabbit, the only thing I could holler was “Elvis” to get her back. When she heard his name, she would come screeching to a halt and turn around and come back because she thought he must be here or I wouldn’t be calling him. Just a note here, this only worked about three times before she realized what a liar I was. If Elvis wanted you to notice something he felt was important on the location, he would come over and place his huge front paw on your arm and pull at you to follow him. But most notably, Elvis loved to play the game Hide-and-go-Seek. I’m not kidding. This is how this went. I would set him down with his back to me somewhere and tell him to stay and I would go find a place to hide really well. Then I would call and tell him to find me. And he would look and look until he’d find me. When he did, he would be so excited and I would laugh that kind of laugh you only have when you are really having fun. Elvis and Evelyn were inseparable. Since the loss of her husband Wayne in 2005, Elvis had become her helper – her confidant. He was whose furry neck she cried into when the people in Evelyn’s life had grown weary of her grieving for her husband of 24 years. Elvis understood, there is no real time limit for deep grief. In the evenings, after a full day of seeing oil wells, Elvis was who would gladly run around in the house, playing Hide-and-go-Seek with her too. The two would put on a country music CD and Elvis, who was as tall as Evelyn when he stood on his hind legs, would stand up and the two would dance like crazy. Elvis had a cat too. Her name was Savanna. Savannah slept literally in the leigh of Elvis’ neck, where his jaw met his neck. It was Thanksgiving of 2013 and I was pumping wells but Evelyn had left to go see family. Earlier that day she told me Elvis wasn’t feeling good and would I go to her house and check on him . He had just thrown up a couple of times and while that didn’t seem too odd for dogs that sometimes eat myriad dead animals while working with us, it still concerned her. When I got there, I could see right away, something was terribly wrong. Elvis was standing, leaning forward and could hardly move. He wouldn’t even look up at me. I could sit down, he couldn’t lay down. He was in misery. I called her and told her, he had gotten much worse. She dropped what she was doing and made the nearly two hour drive back and rushed him to the vet. The day after Thanksgiving, Elvis died. We are not sure what killed him and we will never know. We fear he might have gotten into someone’s garage and possibly drank some coolant. He was so well loved that several people in the community came out for his little burial service. I brought his best friend, my dog Nipper who was pretty upset. She went to see her friend’s body and sat next to him and shook uncontrollably. As much as I try, I can’t unsee that. Nipper was never the same after that. Something was just wrong with her and she ended up dying a year later. And as we all said our goodbyes to Elvis that day, one thing was so clear. The oilfield industry out here in the Panhandle was somehow indelibly changed that day and was the worse off for it. Because, Elvis had left the oil patch. Flowing wells are created when the water and gas produce a pressure forcing the liquid from within the rock through any openings (such as a well). While the pressure may be powerful enough to push the liquids to rise up when created towards the surface; and as time progresses, this pressure will decrease, and lift systems may need to be installed for the remaining life of the well. However, before a lease pumper begins to think about bringing the oil up from the well, you need to consider the different production regulations. Typically lease operators prefer to obtain as much gas, and/or oil, as possible to maximum revenue. 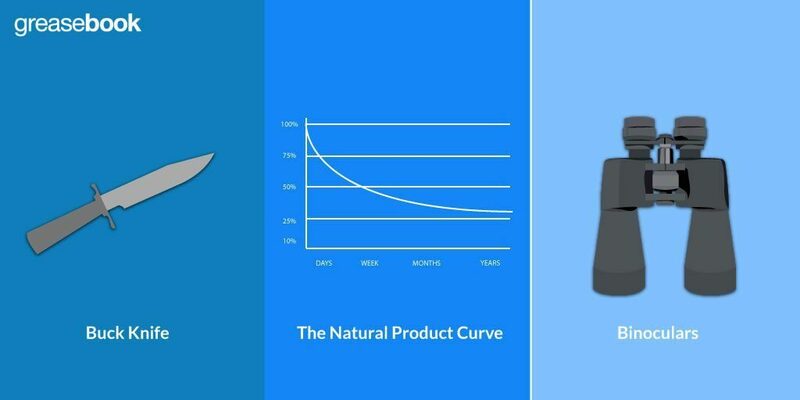 However, while maximum productivity rates can provide more upfront profits, it isn’t always what’s best for the economy, environment, reservoir, or any other considerations aside from the lease operator’s financial interests. To help ensure all factors are considered by the lease operator, a variety of agencies were created for gas and oil production regulations. For instance, local or state examples may include: Oil and Natural Gas Commission, Petroleum Commission, Environmental Protection Agency, or other similar names. The goal of these agencies is to aid gas and oil producers in comprehending any problems or concerns with the reservoir. One of the main responsibilities of these agencies is to monitor and control the production of oil and gas reservoirs. Production limits and regulations help to provide protection for the reservoirs and to ensure their lifespan and durability. Plus, using the proper production practices have been known to extend the reservoir’s production life, and in a higher closing production revenue. Production limits help to preserve the lives of all the reservoir wells. Monitoring and controlling the volume of gas or oil a well can produce, preserves the bottomhole pressure. In other words, the operators will be able to postpone the use of lift systems, and prevents reservoirs from exhausting their resources erratically or too quickly. This is especially true when there are multiple lease operators who yield from the same reservoir. Gas and/or water coning is a serious issue many reservoirs face with producing wells. It generally occurs in an oil zone with either an: overlying aquifer, underlying gas cap, or both. When coning takes place, the zone containing the gas or water moves upward to the wellbore in the shape of a cone. When this situation occurs, the cone will remain in place while productivity has ceased for the well. However, once the the valve is open, it will create higher gas productivity; and thus water will sweep into the well. As the water rushes upward, it forces out the oil; but these little variances in weight will take years for the well to naturally go back to the well’s initial state, and for lease operators to decrease production volume to a fragment of the normal productivity rate. The field operator, lease pumper, owner; it doesn’t matter who was at fault for overproducing the well. When a well is damaged, the entire company pays the price. Therefore, the advised practice for production is to avoid overproducing the well by over 10% of the well’s daily productivity potential. In other words, if the well loses one day of production; it will take ten days for a single day’s loss to be recuperated. If this occurs, the well could still be short of the productivity standards by month’s end. Nevertheless, this is still more appropriate than harming the capability of the well, as overproduction will result in a constant shortage. Sometimes lease pumpers may come across other pumpers boasting of their skills for compensating for lost productivity by secretly overworking different wells. This helps by maintaining a full overall production rate after all production issues are rectified. While supervisors are typically pleased with the numbers, these results only shorten the overall life of the well and decrease their long-term potential. The U.S. is among only a handful of countries where multiple companies, governments, individuals, states, and/or trusts can own the mineral rights. 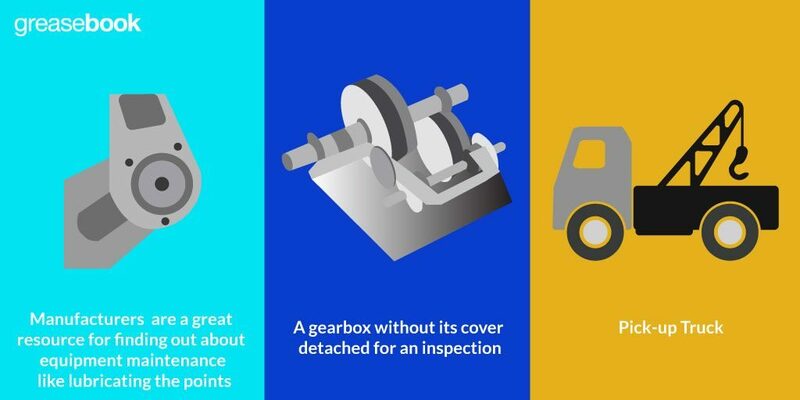 Due to this, productivity procedures from one operator can cause extraordinary productivity issues for lease operators of nearby wells; and periodically, extremely severe declines can kill nearby wells. In other words, they will no longer be able to yield gas or oil. This is due to the hydrocarbons being drawn from the furthest reservoir regions where the counterbalance wells might be. 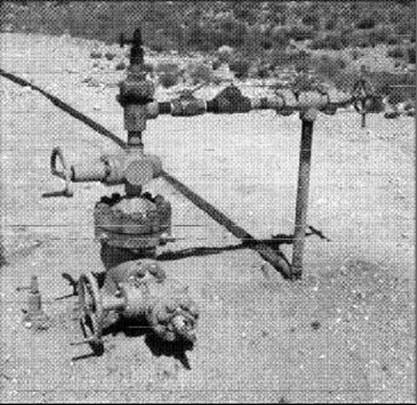 the middle elevated wells to yield large amounts of oil, with extremely small amounts of gas, and little to no water. a lease operator in higher elevated regions (who yields large amounts of gas) – the reservoir would lose pressure, and thus the wells with high amounts of oil would eventually no longer yield oil. a lease operator in lower elevated zones (who yields high volumes of water) – can revitalize the lower the formation pressure and the water drive; which in turn can aid the water table in increasing productivity from large oil production wells rapidly plummets off. A large number of lawsuits have been filed over these type of issues; and the best answer for this is for any and all operators to agree to a productivity schedule for the entire reservoir in advance, this ensures the most effective, efficient, and beneficial wells for all parties involved. For a natural well flow, a well must have ample bottomhole pressure that is powerful enough to force the liquid to surge from within the rock formation, up to the surface, and into the stock tank; all without any external or internal support. As the gas and oil are taken, water can fill the void left from the hydrocarbons as a result of the region’s lower pressure. This process typically takes years to transpire. 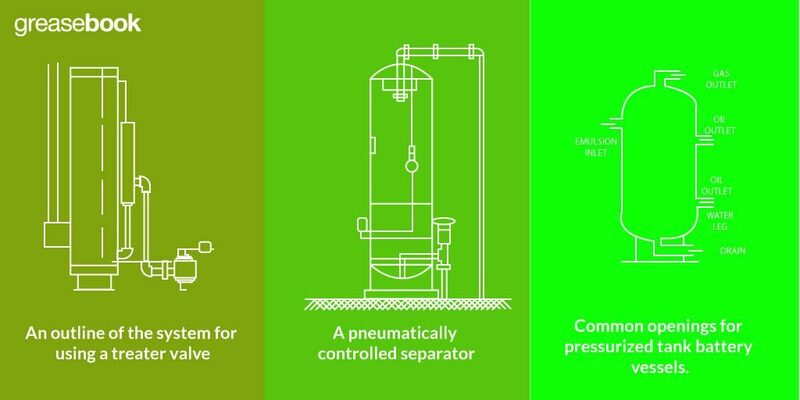 push the fluid into a pressurized differentiating container; all while maintaining enough pressure for the liquid to push through any additional treatment tanks, ending in the sales or stock container. To determine the proper amount of pressure, most lease pumpers use a common guideline stating if a mineral well contains a standing flow of fluid, and a wellhead pressure of 100 pounds; there will be ample enough pressure for natural well flow. The greater the pressure, the larger the maximum yield capacity and the easier the well flow. To prevent the surge effect from occurring, packers are often installed around the tubing string base in the well flow annulus. Without a large bottomhole pressure or a packer, the flowing well will have inconsistent productivity. For example: if the flowing well did not contain a packer, and mainly produced gas with little to no fluid amounts for small intervals of time; the majority of the fluid within the casing and tubing will originate near the tank battery. Once the casing has depleted of fluid, the gas pressure within the annulus will splinter throughout the entire area and inside the tubing perforations. The abrupt increase in gas will remove the majority of the fluid within the well, all the way up to the tank battery. However, once the loss of gas occurs, there will be a significant drop in gas pressure in the casing throughout the entire system. Once this pressure depletes, and the fluid starts to once again pool in the well’s base, the casing pressure operates as a flow buffer or pressure surge tank. In order for the well to flow again, it will require the casing pressure to improve to a level that will grant the well the ability to cultivate enough bottomhole pressure. This unpredictable well flow activity is often reduced and/or eliminated by situating a packer near the base. However, flowing wells with extremely high volumes generally do not have packers, and can be produced throughout the casing. Packers are removed once a well is no longer flowing naturally. It is then transformed from a flowing well into a pumped well. Once the packer is removed, and all is said and done, the casing valve will be constantly open to the tank battery to remove the formation of bottomhole pressure. Near the wellhead, a check valve is positioned to prohibit oil from being forced out of the tubing and flowing back down into the casing. This allows the bottomhole pressure to deplete to the weight of the separator pressure, the flow line resistance, and the weight of the fluid line within the annulus. However, the lease pumper must constantly be mindful of any and all situations that could change this delicate harmony; because even the smallest changes can affect the well’s oil productivity. For instance, if the lease pumper were to make a five pound increase to the separator pressure; then the formation pressure will also have been increased by five pounds, and the oil productivity will consequently diminish. 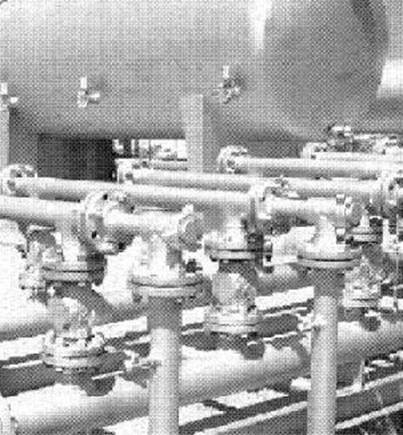 Once the gas production has reached the trace classifications, casing valves can be exposed to the air and atmosphere. Generally a flowing well contains a Christmas tree comprising of: a wing valve, a variable choke valve, a master gate valve, a positive choke, and a pressure gauge; with each Christmas tree containing at least one check valve. 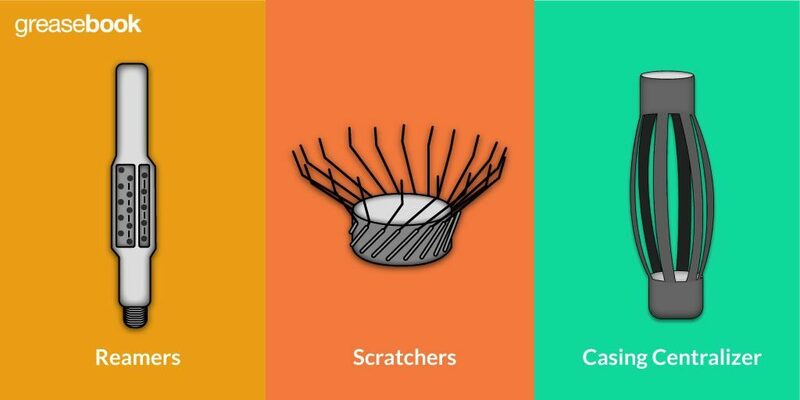 To fully understand how this works, make sure you educate yourself in the basics of each area. Figure 2. 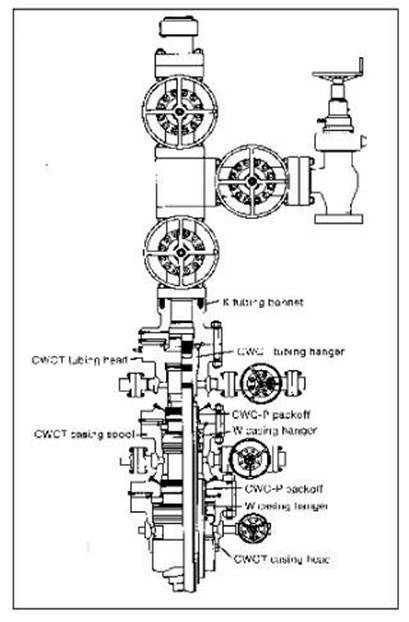 An example of a typical flowing well Christmas tree configuration containing a: check valve, flow line, master gate valve, wing valve, and variable choke. Whether or not a packer is utilized in the annular space at the base of the well, a casing valve (a multiple round opening gate valve) is almost always fastened to the Christmas tree and to the flow line towards the tank battery. This allows the casing valve to be bled down, closed, opened, or even to permit the flowing well to advance to the casing and tubing. In cases where packers are utilized, this connection isn’t used until the packer is either loosened or completely removed. The casing valve can generally tolerate high pressures; and similar to wing valves, do not have to use a full opening. This type of valve is often utilized to help determine if the tubing or packer has developed a leak. Check valves are generally inserted as soon as the flow line vacates the well, a second one is typically placed near the well’s tank battery; or to be more precise where the tank battery separator head meets the well’s flow line. Some lease operators prefer to have the check valve directly behind the wing valve, yet still in front of the choke valve; while others prefer to place it close to the ground, near the tank battery. Having the optional check valve along with the ground level option, allows for the Christmas tree and riser pipe to be easily eliminated when they are no longer needed. Depending on the operator or company, all three may be installed. This type of valve is made of a superior grade valve. It has the ability to open up to match the inside tubing, which allows any specialized tools that may be required to pass through. Master gate valves require the ability to hold the entire pressure of any anticipated events that could occur to ensure well safety. This valve typically remains unblocked, and it is not utilized as a butterfly valve (or throttling valve) for controlling production flow. In most cases, the Christmas tree atop the well (see Figure 3) contains the positive choke, or it is located at the inlet manifold immediately in front of the first separating vessel (see Figure 4). However, many operators are known for using positive chokes at each site. Figure 3. 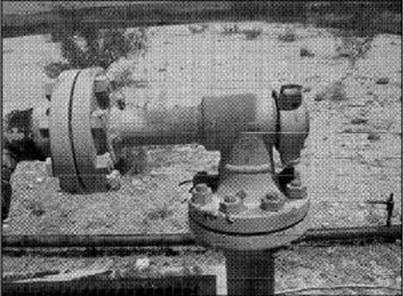 Example of a positive choke situated atop the wellhead. Figure 4. Example of a positive choke placed near the tank battery. An unmistakeable advantage to using the variable choke instead of a positive choke is the ability to easily change the settings. 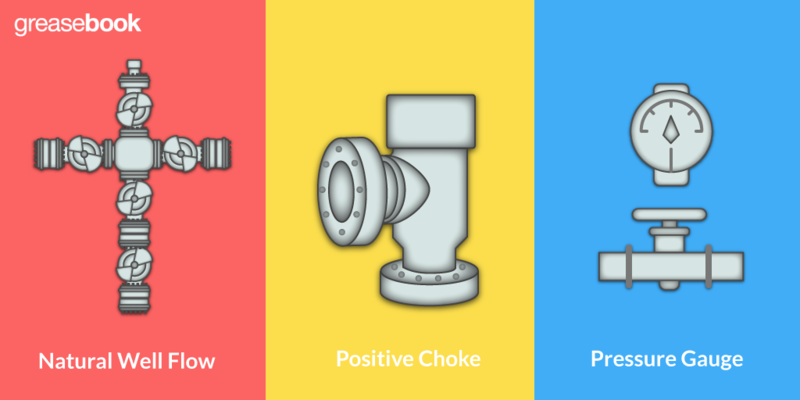 Positive chokes can easily regulate the flow, allowing the well to match the proper daily productivity levels. This is accomplished utilizing a correctly sized flow bean. 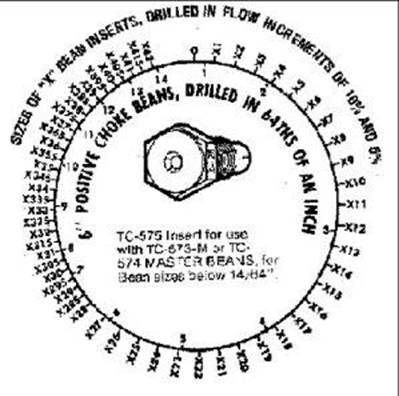 As shown in Figure 5, these beans are offered in 74 different sizes and are created to permit an increase in flow from anywhere from 5-10%. 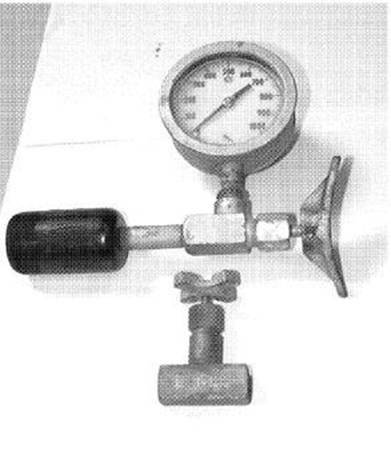 This type of gauge is made of a high-pressure steel. It is typically situated just atop of the well’s master gate valve. It will also have a ½ inch needle valve (including gauge), and a tapped bull plug. Each of the high pressure needle valves can be used in 90 degree (ell) and 180 degree (straight) options. This allows the worker to read the valve pressure from a favorable angle. Figure 6. Example of a valve with pressure gauge located atop the well. This type of valve is generally a type of extremely large needle valve. It has a calibrated opening for workers, so the device can be customized using 1/64 inch sized measurements. Variable flow choke valves are very expensive; and are typically made of stainless steel, steel, or tungsten carbide steel. Since the valve requires the ability to tolerate the high speed flow of the various abrasive materials, a high quality steel must be used. In most cases, this will help safeguard against damages for several years. Due to financial reasons and the productivity volume, ¾ inch valves are most commonly used. However, high productivity wells typically require variable choke valves of 1 inch or more. Each valve is carefully marked to identify the specific opening size. You can indicate the size of a fully open valve by the last number. For instance, if the valve is 32; it is 32/64ths or ½ inch. It is important to keep up with all aspects of the well. For instance, if there is any paraffin or salt water in the oil, it can cause the opening to clog. Therefore, it is recommended to periodically have the choke open to higher settings for short intervals; followed by periods of opening and closing it back up. This allows the well flow to clean out the seat and eliminate any buildup gathered within the variable flow choke valve. 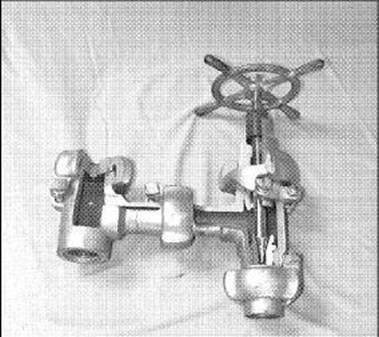 On occasion, this type of valve can be set to productivity speeds permitting water to collect at the base of the well by dropping back down through the tubing string. As the water pools, it will slowly start to prevent the oil productivity; and at times, can even destroy the well. When this occurs, it will be necessary to use a swabbing unit to swab from the tank battery to the water blanket in order to obtain proper flow. Increasing the flow rate in the choke by widening the opening for short intervals can help to prevent this issue. A wing valve can be either a multi-round opening valve or a quarter-round opening. Often times lease operators will utilize plug valves; but in recent years, the ball valve has become increasingly popular due to its operational ease, and great economical value. However, wing valves are customarily used to shut a well. This is due to their ability to easily read the tubing pressure. Whenever bottomhole pressure decreases, there will always be a corresponding reaction (or downturn) in gas and oil productivity. During this lower productivity stretch (or as the reservoir hydrocarbons near exhaustion), the well is commonly referred to as a marginally producing well, or a stripper well. As the stripper well’s productivity diminishes, lease operators will be required to determine if an artificial lift system should be utilized. In most cases, a flowing well’s maximum lifespan (before it requires an artificial lift) is determined by the lease operator. One of the most vital skills for operators is the competence for making the best decisions for the productivity and longevity of each well during the marginally productive period before installing the artificial lift. This ability can not only create satisfactory productivity levels with lower down time; but it can also extend the lifespan of the flowing well before it requires an artificial lift. Is your appetite for oil & gas operating knowledge insatiable like ours? 😀 If so, check out this related article, A Lease Pumper’s Basic Guide to Plunger Lifts – it will surely pump you up!! !